So as a child I really liked biking. I learned to bike early on. Like most kids I started out with the tricycle peddling my little heart out up and down our block while my parents watched me on the front lawn. When I was 6 I upgraded to a “big kids bike” but I still needed the training wheels so I didn’t topple over. My parents and I would always bike around town to our favourite spots. The play ground down the street or the path down by the river. As I grew up I started biking less and less because my friends and I all got cars. We would think to ourselves “Who rides bikes any more… that’s so uncool” (Thinking back we weren’t exactly the trend setters of the high school either). When I moved to Waterloo for school it seemed like lots of people would ride their bikes around town. Considering I left my car at home and had to walk and bus everywhere I was pretty jealous of the people with bikes. They had all the freedom to go where they want when they wanted (no waiting for the bus!) I still don’t have a bike with me in Waterloo but I look forward to the day when I can go up to a bike share station unlock a bike and go for a ride. My name is Angel Liu. I moved to Canada from China five years ago and currently studying in BBA – International Business Management at Conestoga College. This volunteer opportunity at GRPBS appealed me so much because personally I believe in the public bike sharing program could be extremely helpful for the environment and individual’s health condition. My role at GRPBS is marketing assistant. My major duties are promotion campaign planning and sponsor approaches planning. GRPBS will help people in the Kitchener and Waterloo community become closer. I also believe bike sharing program will become a great transportation option for university and college students in the future. When I was in China, biking is the most popular transportation beside busing and driving. Almost everyone in China knows how to ride a bike. It was the daily transportation for me when I was going to school in China. In Canada, it is difficult to find a parking spot for cars. However, in China, there are times when people can’t find parking spot for bikes because there are too many of them. I am not kidding. There was one time I was waiting in line to park my bike for 15 minutes. The bike share programs were introduced in China few years ago and it become very popular once it was launched. People do not need to worry about bikes being stolen or looking for bike parking spot. This is why I love bike share program so much. I’m hoping the Grand River Public Bike Share program could come out soon and let everyone enjoy some biking exercise! 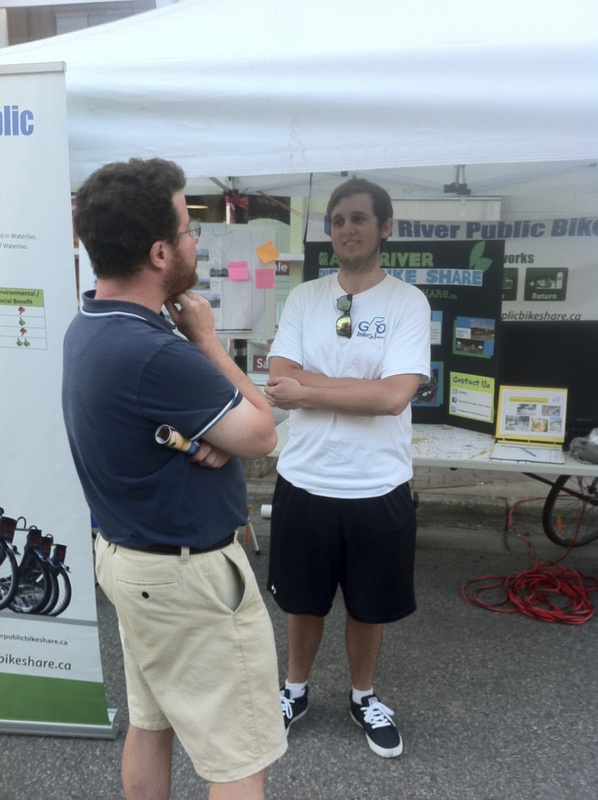 My name is Sam Lidstone and I’m a volunteer marketing analyst for the Grand River Public Bike Share. I’m responsible for making sure you know about the GRPBS and the benefits of what our program can do for the Waterloo region. But most importantly, I am here to spread the word and show people why the Grand River Public Bike Share is for them! Just to give you a little bit of information about myself, I am a graduate from the University of Guelph’s commerce program and I have always wanted to be involved in a green movement of some kind. I have worked on sustainability projects while in University which included advocating for grey water recycling systems, and building a sustainability business plan with the City of Guelph. I love biking around town to get to work, school, and explore the city with friends all while getting some exercise. 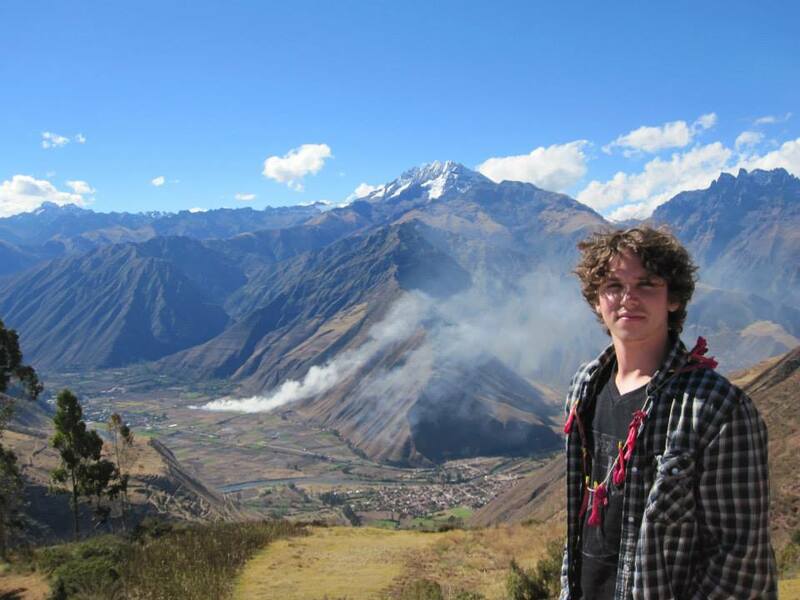 I am also very passionate about music and I am currently working on an album with a local band. With the GRPBS I plan to assist in creating an engaging social media campaign to raise awareness in the community, develop a viral video to encourage donations, sign up sponsors and subscribers, and assist with special events. In the coming months our team will be looking to raise money to support the ideal launch of our program in May. We are looking at subscriptions, donations, crowd sourcing, and sponsorship as our main avenues for funding. Any contributions will eventually help the Waterloo Region and our community through reduced emissions, more efficient transportation, healthier people, and a greener tomorrow for future generations! With the snow stubbornly clinging the streets and trails that I recently frequented with my two-wheeled companion, I have no choice but to resign myself to the garage where I can prepare my bike for the coming Spring. This year has been particularly hard on my bike. The kilometers that I have pedaled since April seem too numerous to quantify, and the minutes too enjoyable or in some cases painful to recount. During the summer they seemed to build on to each other without beginning or end, but now with my bike in the repair stand it is easy to reflect on a season well spent. For me, overhauling my bike has always been a nostalgic experience. The cake of mud to be scrubbed off of the head tube will remind me of the pouring rain that surprised me on a run of the Hydrocut. The slight wobble in my rim will remind of the root that reassured me that flying is not a pleasurable alternative. But most of all, when I have my bike separated into each of its individual pieces I will be reminded that all it takes is a few good parts, fitted together, and pointed in the right direction to do something amazing. The GRPBS is great illustration of this principle. I have worked with them for only a short time but I am inspired by the challenge that they have taken. The volunteers that I work with are great people that just want to make a difference in the community and on the environment. They have kids, work full time jobs and still manage to approach this undertaking with less whine then a well-aligned brake caliper. So cheers to them for their dedication to the Region and their forward thinking. The winter may signal the end of the biking season. But as we prepare for the launch of the GRPBS in the Spring of 2014, I am encouraged and optimistic for the ride up ahead. It has been an exciting season for GRPBS. We now have approval from the City of Waterloo for space to put docking stations for the bikes. We know that cycling is a good form of exercise, and it turns out that if you do it as part of bike share program its good for the local economy too. 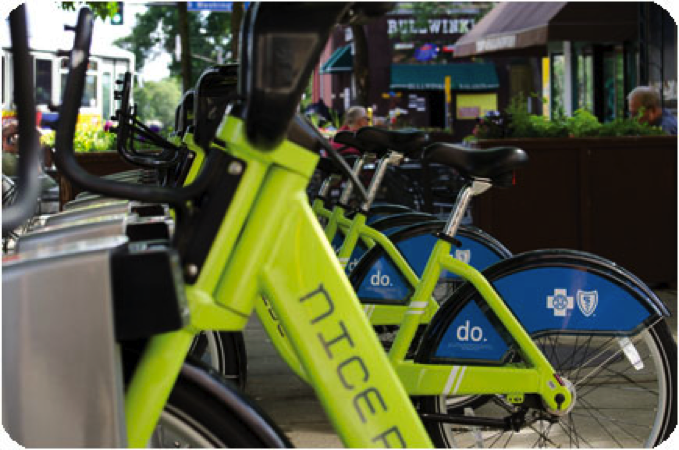 A 2012 study from Humphrey School of Public affairs at the University of Minnesota found that the bike share users in the twin cities of Minneapolis and St. Paul brought it an additional $150,000 to the local economy per year. This information bodes well for the economic prospects of Grand River Public Bike Share’s potential impact on the businesses around our bike share stations. So spread the word; bike sharing can literally spread the wealth. If you have ever had a chance to go to Europe then you know the pleasures of visiting the plazas or squares in the centre of most towns. On any given night you will find thousands of people walking around the square going to restaurants, watching street performers or simply enjoying the night air. We here in Waterloo have a similar event called Open Streets. 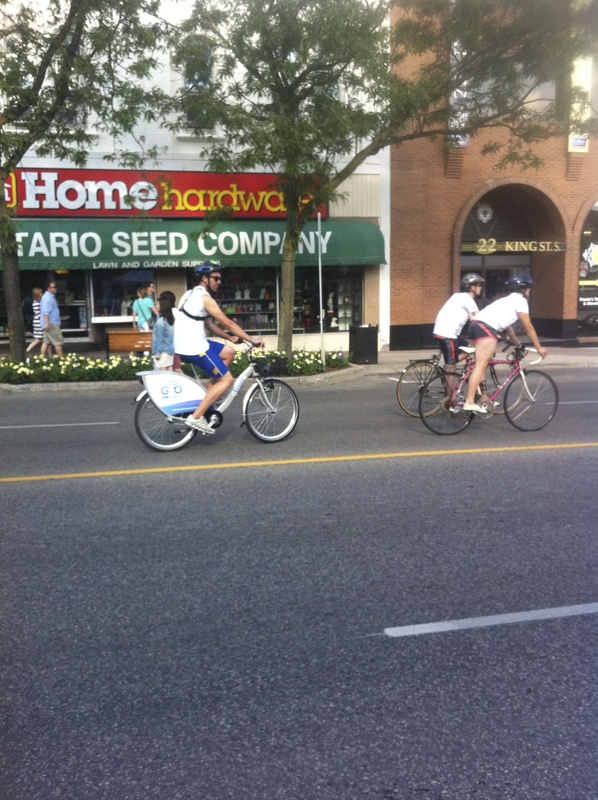 On Saturday July 20th Grand River Public Bike Share attend Open Streets at Waterloo. Our volunteer team set up a booth and our purpose there was to grow awareness for the up coming Waterloo bike share program. At the open street event our booth prompted excitement from the city’s avid cycling community, as well as students and the general population. GRPBS are in the advanced planning stages before we launch our bike share program in the spring of 2014. Once the program is launched, Waterloo will join the 240 bicycle share programs around the world. At the Open Street event, two of our members, Mike and Lorenzo participated in the Together We Travel Cycle event to honour fallen cyclists. Lorenzo was advertising GRPBS by riding our demo bicycle. The GRPBS booth was located on close Willis Way and King Street North. Manning the booth was Prasad Samarakoon our executive director and our volunteers, Lorenzo Carboni, Daneal O’Habib, Mike Playford, and Hamza Sayed. A lot people had questions about the bike share program. People inquired about the cost of the program, when we will launch and where we will have stations. In addition to answering questions regarding bike share, our volunteers highlighted the many economic, social and environmental benefits a bike share program brings. Overall Open Street was a success and its great to see first hand how excited the people of Waterloo are for a bike share program. If you missed our booth at Waterloo Open Streets please take the time to visit our website and checkout our crowd share map.